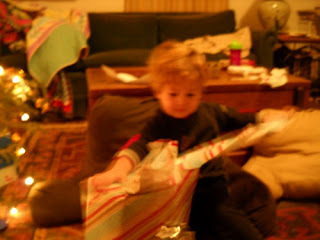 I took this week off to spend Christmas time with my family. Here's a few photos of our celebration. Gavin putting lights on the tree. Levi and Trent outside with a Snowman. Levi working on the train for under the tree. 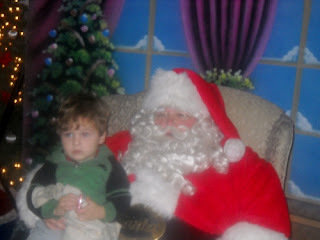 Trent visiting Santa for the first time. 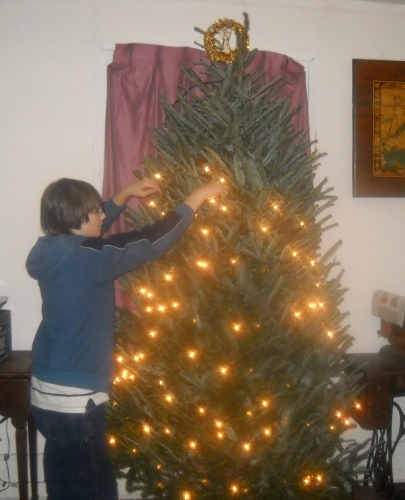 Our tree all decked out. Yes, we're dreaming, here. No white Christmas in sight. It's been warm enough to play outside this week. And though we had a small cold front come through last night, it wasn't that cold! Not that I like to be cold - I don't! It just seems more Christmas-y when it snows a little bit. Maybe you are having a little snow in your corner of the world. Just a little. Smile. So, I worked on my Frosty Table Runner this week. The whole center section came together yesterday. Everything went smoothly. Frosty is fusible appliqued with a tiny zig-zag stitch around the edges. The evergreen trees are paper pieced. The tree trunks are made out of a metallic etched leaf print - very pretty! The block background fabric looks like falling snow. I'm going to add a thin red border, and then another blue border to finish it off. Here's the Frosty Quilted Trivet. 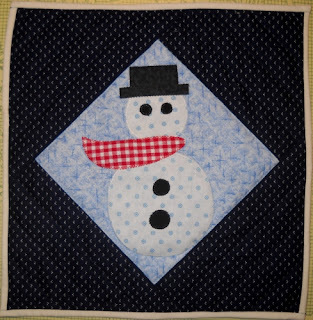 It is made from the same Snowman block as the table runner. In other news, be sure to mark your calendars for January 11, 2012. 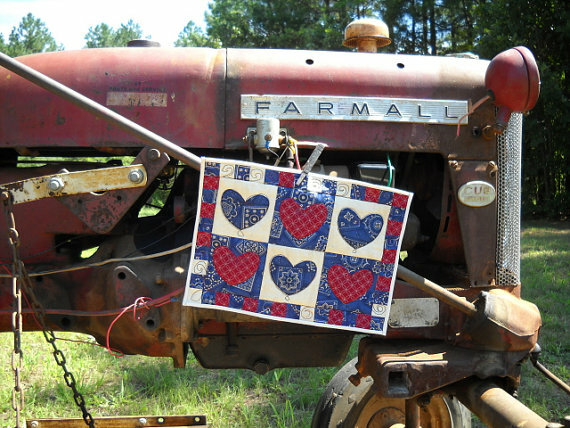 I will be a guest blogger at the Quilting Gallery on that day. I'm so excited! I will be having a giveaway of one of my patterns, too. 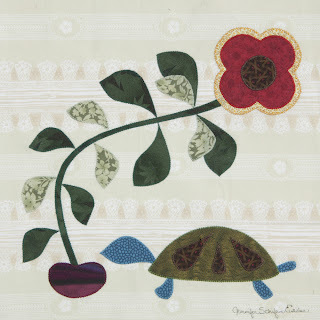 If you have not been to the Quilting Gallery, you should visit. It's a great site. 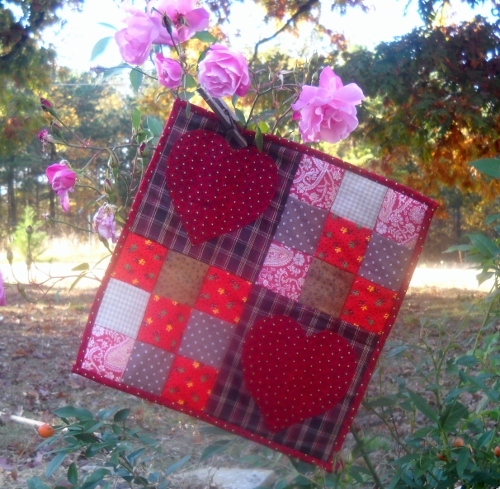 They have contests, giveaways, and links to endless quilting bloggers. My favorite feature is the way they have the quilting bloggers set up. 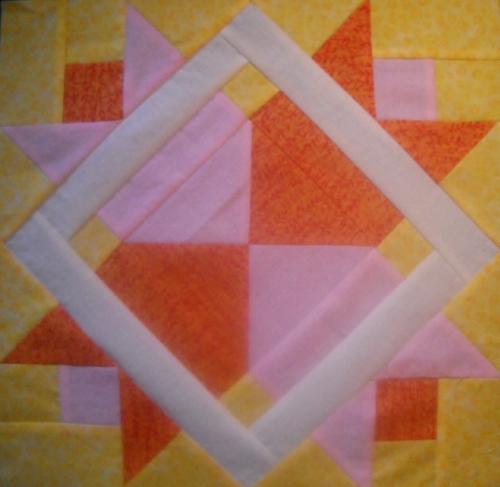 You can look up bloggers by country or state, to find other quilters near you, or meet someone from across the globe. Until next time....please visit the Curlicue Creations shop, and have a super day! On the first day of Christmas, my truelove gave to me a Frosty Tablerunner! I designed this cutie using the Frosty Quilted Trivet snowman design. I added a zippy looking evergreen tree to each side of Frosty, and voila! Another project for me. Just what I needed. It looks like fun, I will squeeze it in somewhere. Button Dolly and her new best friend. 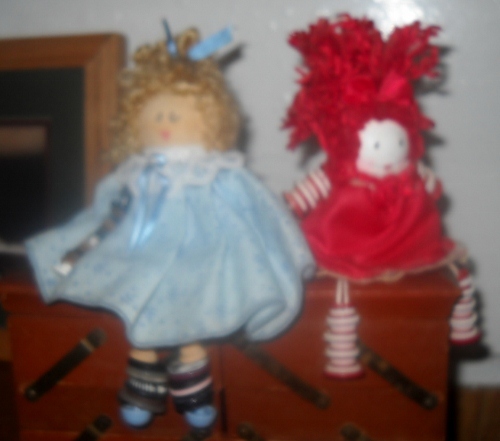 I know everyone fell in love with button dolly and her bright red hair. But she was a little lonely, even with all the kind e-mails she's been receiving. I had to pick up a friend for her this week. Button dolly's best friend, blue button dolly is equally as cute! Her arms and legs are made of stacks of blue, white, brown and black buttons, with a couple of little wooden spools, too. These gals need some names. Ideas, anyone? I've also been working on a new pattern for the Americana Bandanna Quilted Trivet. It should be in the Curlicue Creations shop sometime later this week. The Checkerboard Cat Quilt Block Pattern is in the shop now. It is the first in a series of Cats in Baskets block patterns. 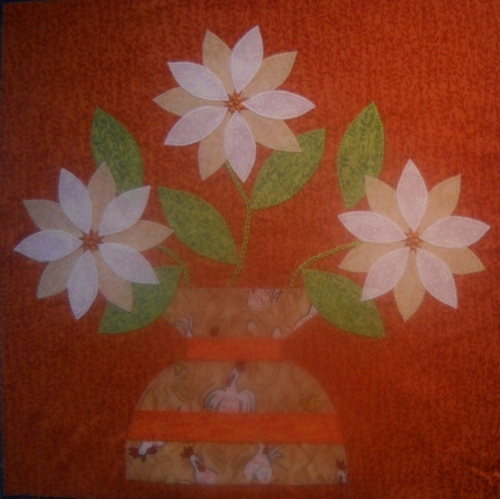 Each basket features a different traditional quilt block. It's a sampler of sorts. There will be twelve blocks in all. 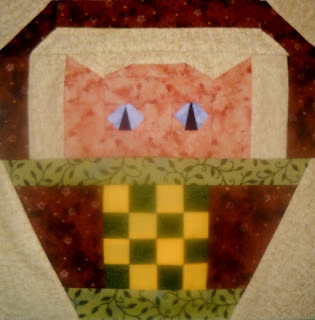 At only $3.00 per pattern, this is a fun and affordable way to make a paper-pieced cat quilt. Meow! Until next time....Have a super day! Keep quilting, and please let me know what you're up to. I love those comments and meeting you all! How many more days until Christmas? I don't want to know! I'm not ready! Will Santa make it to my house this year? Not to mention the birthdays. How did I manage to have two children with birthdays right around Christmas? What was I thinking? Anyway, if you're like me, you are now realizing that there's no way you're going to finish all those good intention handmade gifts you planned on sending to everyone. :) Christmas cards? Christmas cookies? I'm lucky to have the tree up and decorated. It is beautiful though...sigh! I made this Olde St. Nick block months ago, while testing for Quiltmaker's 100 Blocks, Volume 4. I want to put those blocks together into a "Storybook" quilt. I can see it in my head, but when will I get to that one? 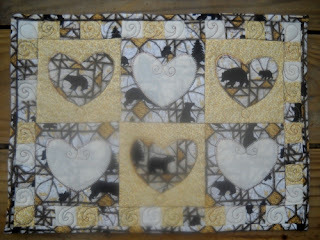 I did finish the Mountain Bears Quilted Trivet and put it into the Curlicue Creations shop this week. This would make a nice last minute gift for that bear lover in your life. It measures approximately 11" x 15, and features primitive curlicue quilting, and cute bear silhouettes. 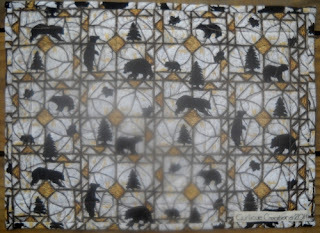 The back of the trivet also features the bear silhouette fabric. 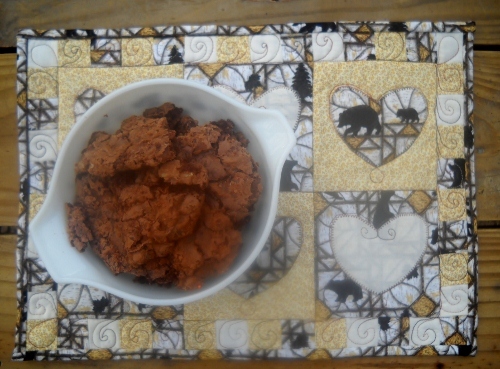 This trivet makes your Christmas cookies look extra yummy! 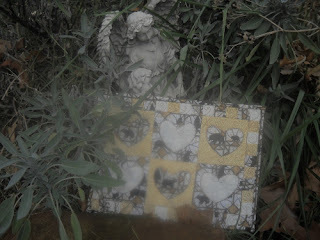 One more shot of the trivet hanging out in the garden with the angels. I also started working on patterns for my Cats in Baskets series. The first one will be the Checkerboard Cat. Each basket in this series features a different traditional quilt block, making it a sampler of sorts. There will be 12 blocks in all. 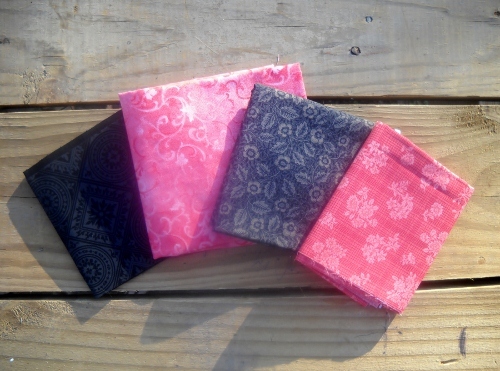 They all feature precise paper piecing for gorgeous results! Until next time....Merry Christmas! Happy Holidays! Be sure to visit the Curlicue Creations shop! And as always, have a super day! Yes, it's holiday time again! 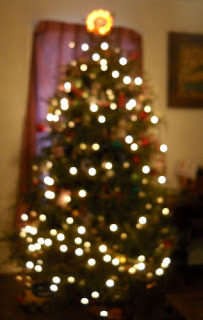 I've been busy trimming the tree, decking the house in sparkly lights, and listening to Christmas Carols. Levi, my 7 year old, heard a line about mistletoe in a song, and thought it was "missile toe". That reminded me of when my now 12 year old, Gavin was little and thought Feliz Navidad was "sneeze, sloppy dog". 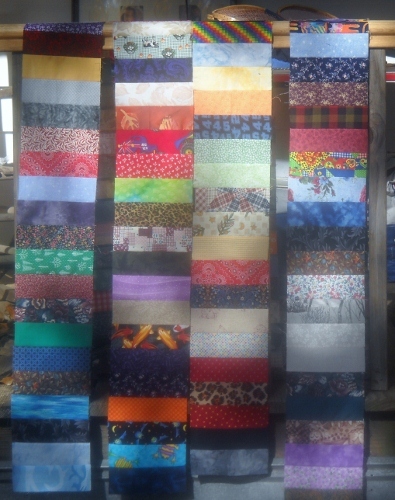 These could make some inventive quilt blocks! 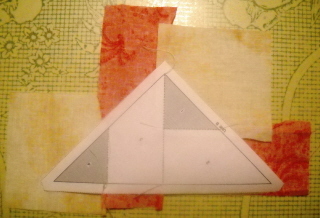 Here's a pic of the Pine Tree Quilt Block Pattern. It makes a 9" paper pieced block. It's available in the Curlicue Creations shop right now! 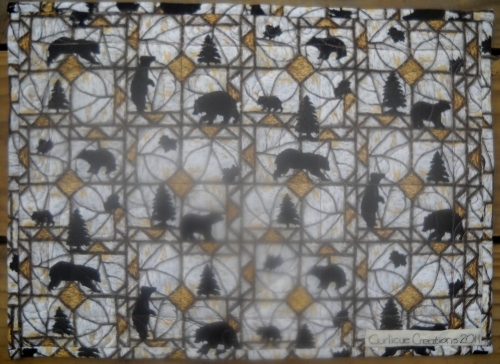 I'm also busy working on the Mountain Bears Quilted Trivet. 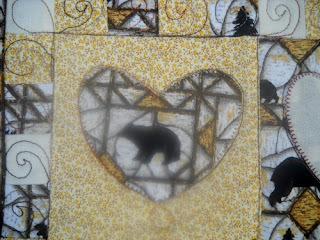 See the cute bear silhouettes in the hearts? This should be available for sale in the shop soon! Yesterday I scored these great new scraps (most are just about fat quarter sized) and also a twin size roll of batting for $5.00! I just love thrift shop hunting! What can I make with these? Hmmmm.....sloppy dogs and missile toes? Until next time...Have a super day! 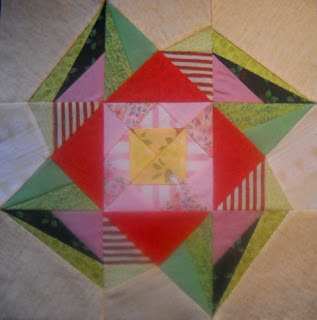 Here are the blocks that I tested for Quiltmaker's 100 Blocks, Volume 4. Enjoy! 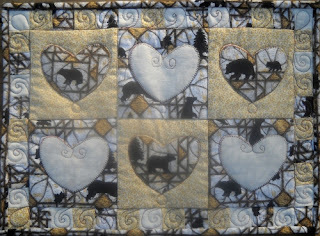 Block #313, by Susan Marth, Suzn Quilts This block is so perfect to begin the holiday season with. 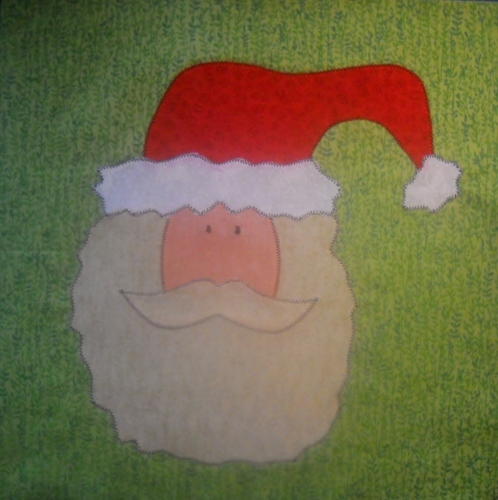 I loved the black outlines Susan used for this fusible applique Santa block. I used a tiny zig-zag stitch on my block and also machine satin stitched the eyes. Block #309, Cheryl Haynes, Prarie Grove Peddler I did this block in similar colors to Cheryl's original. I love the dark background. It really makes the white flowers pop out. It was fun to place the petals just to to for the flower centers, which look like small stars. I also enjoyed making the chain stitched stems. 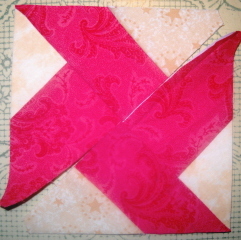 Block #325, by Chris Hoover, Whirligig Designs This block is paper pieced. The shapes were unusual and it was interesting to watch this block take shape. Block #316, by Denise Russart, justquiltin.wordpress.com This block is so cute! Denise does a lot of these doggie designs. The directions are for needle turn applique, but I did mine as a fusible applique. I forgot to reverse the pieces, so my puppy is facing the opposite way! 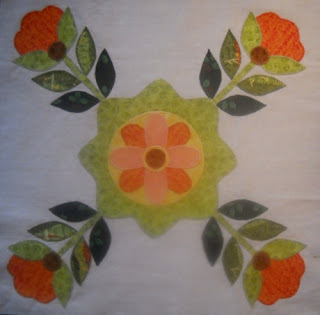 Block #317, by Erin Russek, One Piece at a Time Quilts Another really pretty floral applique block! I just love doing these. The pairs of leaves were just darling. Block #348, by Moira McSpadden, The Quilted Snail I had a hard time getting the pieces of this block to fit together properly, but it was worth it in the end. I used quite a different color scheme. 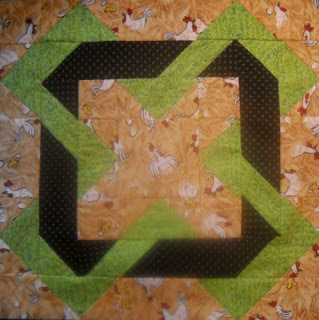 It was fun to put the chicken fabric as a background for this block. 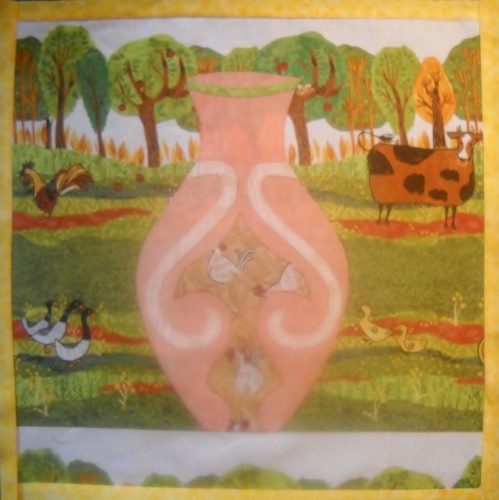 Block #345, by Becca LoGuidice, Willow Hill Quilts Becca's block is much more elegant than mine, but I tried to stay in my color/fabric scheme and made this fun block with the farm animals looking on in the background, and using the chicken fabric again on the vase. Cute? Block #349, by Amanda Murphy, Amanda Murphy Design Here's yet another great floral applique block. I tested this one when I had a bad cold, so I was really unsure of my color selections until I finished the block. I guess they look okay together. 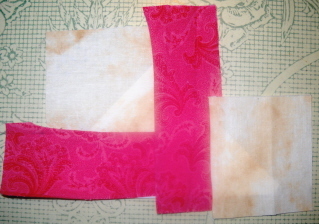 I really like the red stripe fabric and used it in quite a few of my tester blocks. 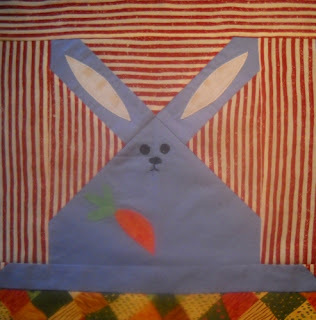 Block #353, by Marjorie Rhine, Quilt Design NW Quite an original looking bunny, I must say! The more I look at it, the more I like it. 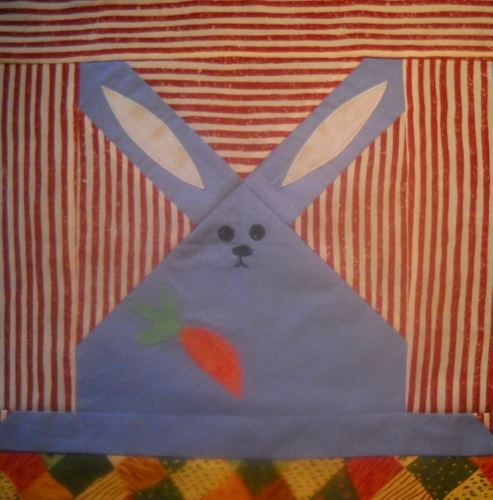 It was fun to match the red stripe going around the bunny in this block. The eyes and nose are fusible applique, but I think this would also be cute with button eyes. Block #384, by Judy Laquidara, Patchwork Times This block was fast and fun to put together. My block looks more like some kind of fanciful Easter flower than a cactus! I really used different colors than Judy! Block #360, by Terry Clothier Thompson, Peace Creek Pattern and Book Company I really love the colors in Terry's version of this block. Mine came out a little faded. It was fun to accent the flowers with a little bit of embroidery. With both piecing and applique, there is a lot going on in this block! Block #354, by Laura Stone Roberts, Assistant Editor, McCall's Quilting This has got to be the most unusual block I have ever made. Each little square has a french knot in the center. What an original design! Until next time, please visit the shop at Curlicue Creations. Have a super day! Thanks so much to everyone who joined me and all the other designers for the blog tour last week. It was a blast to visit all the great blogs, and to read everyone's comments. 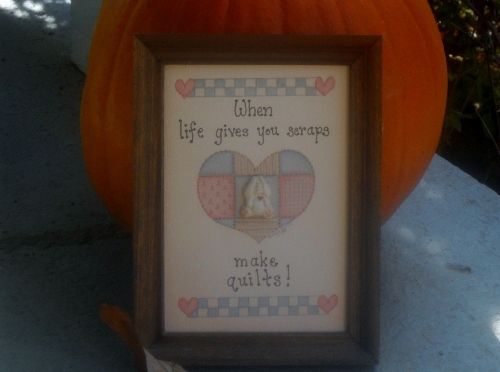 Don't forget, the Quiltmaker's 100 Blocks, Volume 4 will be at your local newsstand tomorrow, November 15th! 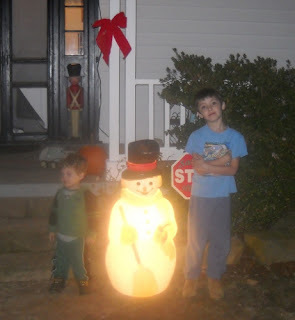 The winner of the free issue from my blog was Jill from Lakeside, California. Congratulations, Jill! 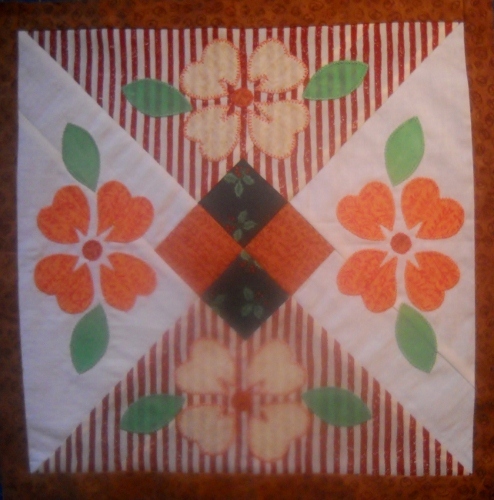 Again, here is a picture of my block from Quiltmaker's 100 Blocks, Volume 4. You can get full instructions to make this block in the magazine. I really enjoyed reading all your comments about strange things found in your gardens. There were 41 different critter sightings, including 10 turtles, a large number of snakes, a scorpion, a couple of tarantulas (Ewww! ), an iguana, a reindeer of sorts, a bald eagle, an armadillo, and a javelina. There were just too many to list them all! Could someone please tell me what a javelina is? I have no idea. Some of you found interesting things growing in their gardens, like a mystery flower, unusual mushrooms, and poison ivy - yuck! Still others found strange items, a pepper shaker with pepper still in it, an old septic tank cover, a g.i. joe doll, etc. One reader even has a motor in her garden! And for those of you who didn't have a garden, I just loved these two creative answers about what you would grow if you did have one. One reader said a fabric garden, and another said money! Here's something growing in my garden! LOL! This week I made the Lots of Love Quilted Trivet and put it in my shop, Curlicue Creations. It measures a handy 12-1/2" x 12-1/2". The back features a cute country scene. You can see the back and some other photos of it at the shop. It's been so much fun making these trivets. They are like mini-quilts and getting to be addictive! Yesterday, I also went into one of the "mystery" boxes in my quilting studio and found these strips for a Liberty Coin quilt. I sewed all of the little strips together to make these four long strips. I'm thinking maybe some black fabric to go in-between the strips. If I ever finish it, it would make a nice bed quilt for one of my boys. ;) Back into the box it goes, for now! And now the shopping spoils of this week! I couldn't resist this cute button dolly I saw at a local thrift shop for 25 cents. Her arms and legs are made out of strips of red and white buttons. I just love her bright red hair, standing straight up on top of her head! Too cute! 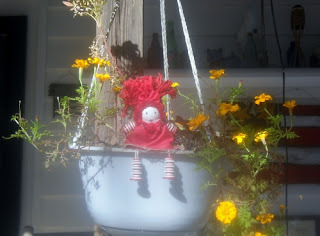 Especially posing with my still blooming basket of marigolds. 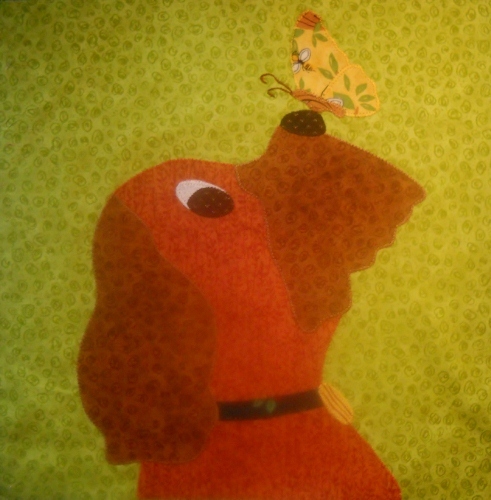 Wes brought this cute print home for me along with some quilting books. One of the books is "Olympic Games Quilts - America's Welcome to the World". This book has pictures of quilts that were made for the 1996 Olympic Games in Atlanta, Georgia. One quilt was made for each participating country - 396 in all! There are patterns to make a few of them, but the real treat is looking at all 396 of them! Great eye candy! A lot of these quilts have nice movement to them. Fitting for the Olympics! Until next time! Please visit the shop at curlicuecreations.com and also "Like" us on Facebook. Oh yes! The day is finally here. 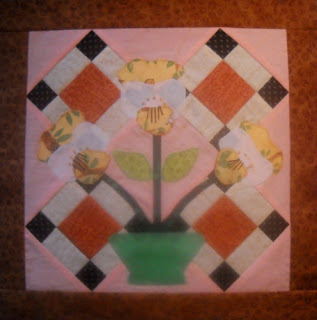 I'm as happy as the day is long that you have decided to visit my blog today for the Quiltmaker's 100 Blocks, Volume 4 Blog Tour. Thanks so much for coming. It's an honor for me to be a part of this, and I want you, dear readers, to be a part of it, too. I will be giving away a copy of the upcoming 100 Blocks, Volume 4 to a lucky reader today, so read on! Here's a peek at the cover of the magazine. I have a copy of this in my hot little hands, and it is just fantastic! There is such a great variety of blocks to make, and it is exciting to see all the designer's creative minds at work. How did I come to be a part of Quiltmaker's 100 Blocks? I started out as a block tester for 100 Blocks, Volume 3. While testing blocks I was inspired to submit a block of my own, and voila! It was accepted for Volume 4. I also tested 14 blocks for the Volume 4 issue. I will be showing my versions of those in a later post, when the issue arrives on newstands, November 15th. Here's my block, In My Garden. So cute! I did find a turtle in my garden this summer. The boys gave it a good examination, and put it gently in the woods. 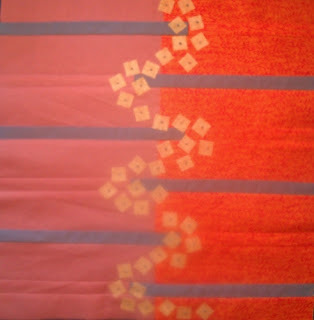 The pieces are all fusible appliqued and edged with a tiny zig-zag stitch. I also made a small wall hanging with my block. I love the way the stripey border looks like the woods at the edge of my garden. The four patch blocks in the corner remind my of a checkered racing flag. Perfect for my speedy turtle! Thanks so much for stopping by today! Please be sure to visit the other designers on the blog tour all week. You can find more information at quiltmaker.com/100blocks. To see more of my designs, please visit my shop at curlicuecreations.com. 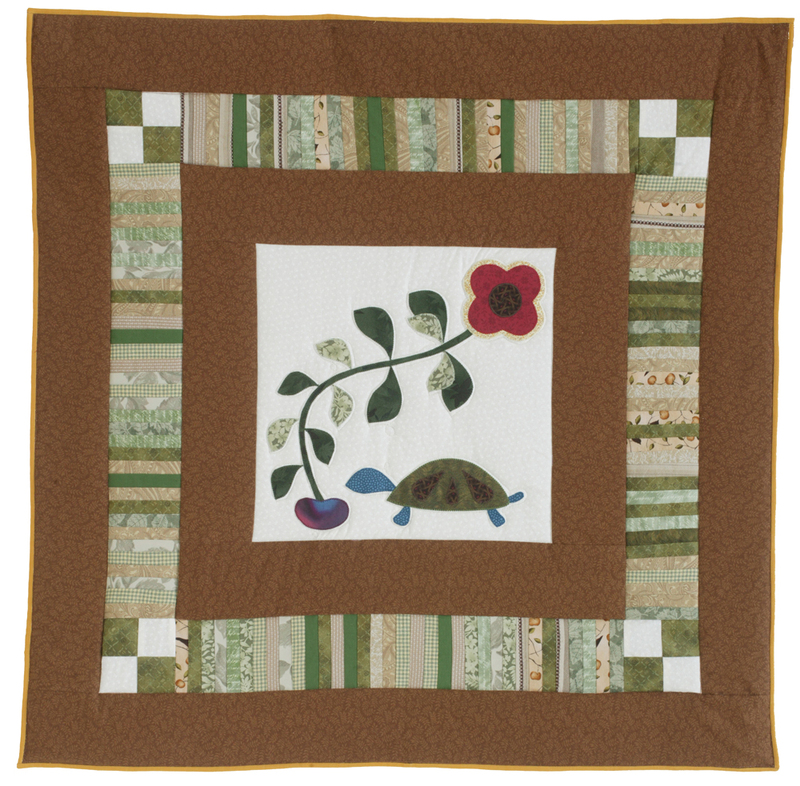 To win an issue of the upcoming Quiltmaker's 100 Blocks, Volume 4, leave me a comment about something unusual you have found in your garden, or if you don't have a garden, what would you grow if you did? I will pick a random winner out of all the comments from today. Until next time, have a super day! Witches, and Cats, and Pumpkins - Oh My! Halloween 2011 is tomorrow, but we've been celebrating around here for a few days already. 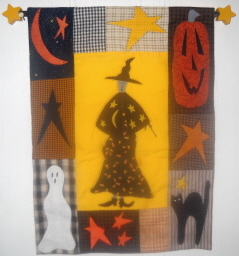 Wes brought home this s-c-a-r-y quilted wall hanging from a thrift shop this week. I just love it! It's hanging on the outside of my bathroom door. Note the wooden stars on each end of the hanging rod - so cute! 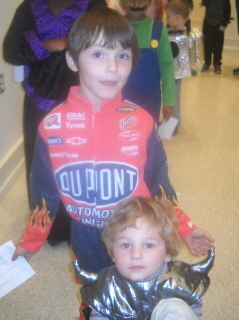 I took the younger kids to a Halloween party at the local library. They got to do crafts, be in a costume contest, and of course eat some treats. 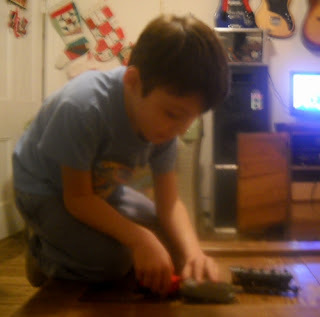 Levi is the race car driver, and Trent is the knight in shining armor. I just love that costume. All three of my boys have worn it. Here's a sneak peek at the Quiltmaker's 100 Blocks, Volume 4 cover. I'm so excited to have a block coming out in this issue! I also tested some of the other blocks, and they are just as fabulous and fun as ever. Be sure to stop by my blog on November 7th. 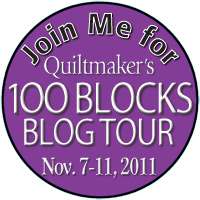 I will be participating in Quiltmaker's blog tour that day. I will be unveiling my block, and I will also be having a special giveaway. 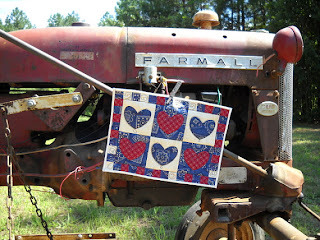 I hope you can join me for the fun & invite all your quilty friends, too! Today I am working on a new quilted trivet, the Pinwheel X quilted trivet. 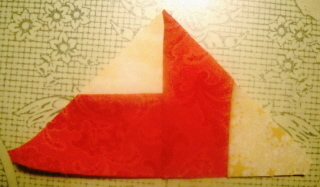 It is paper pieced in two sections. Above, you can see one of the sections, before trimming. Here is the a back view of the section. After trimming, into a nice, neat triangle, corners trimmed, and everything. This is what it will look like when I put the two sections together. The whole trivet will consist of six blocks, and there will be a nice secondary pattern when they are put together. The blocks are 4" finished size. 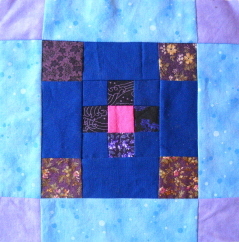 Here is a close-up of one of the blocks for the Ice Pellets quilt. Yes, I am still quilting it. I decided that it needs more quilting, so on we go! Quilt....quilt...quilt..quilt. More shopping spoils for this week - and I didn't even have to leave the house! 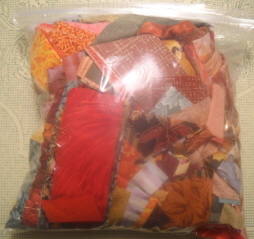 Wes also brought home two super bags of quilter's quality 100 percent cotton scraps for me! I'm so lucky that he is supportive of what I do. Above is a photo of one of the bags. It's been so much fun going through these. Each piece is like a little treasure! Until next time, please visit the shop at curlicuecreations.com, and have a super day!